It wasn't easy to get into Google I/O – tickets to the tech company's biggest event of the year cost $900, and even then they were handed out in a lottery draw. But not everyone in the room on Wednesday was a developer ready to pay their respects to the church of Google. Two attendees were there to express their anger at the company's recent actions: its systematic eviction of homeowners in the San Francisco area, and its recent acquisition of a company that makes "killer robots". The first protester to make her voice heard was Claudia Tirado, an elementary school teacher who is currently facing eviction from her home in the Mission district. She interrupted a speaker mid-speech, shouting "Develop a conscience, Google!" whilst brandishing a t-shirt urging people to stop Google’s lawyer Jack Halprin from evicting her family (Halprin owns the building where Tirado and her family live). After she was removed from the building, a second protester issued forth on Google’s “machines that kill people”, a reference to the company’s acquisition of robotic engineering company Boston Dynamics last December. Scarily, many of these evictions work on the Ellis Act, an outdated law being exploited to allow the eviction of long-time rent-controlled tenants – up 175% in the last year. 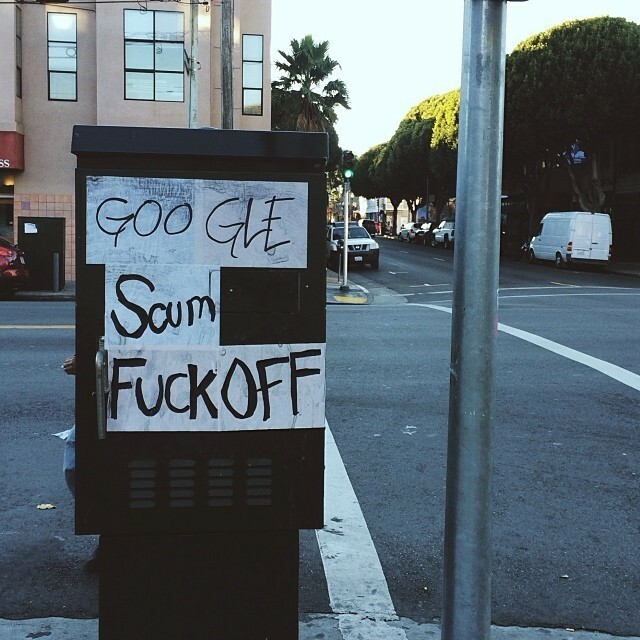 Whether Google will respond to the public outcry remains to be seen – whilst it's been open-minded enough recently to let users’ erase their own web histories, for example, the reality of its effect on the real-world community is bringing public opinion of the multi-national corporation ever lower.